After the weak 3-month (May-July) run for the stock market, shares tend to be stronger in August. Since 1970 the FTSE All Share Index has risen by an average of 0.9% in August, with 63% of all years seeing positive returns in this month. Since 2000, performance has been weaker (inline with the general market), but returns in August have still been positive. 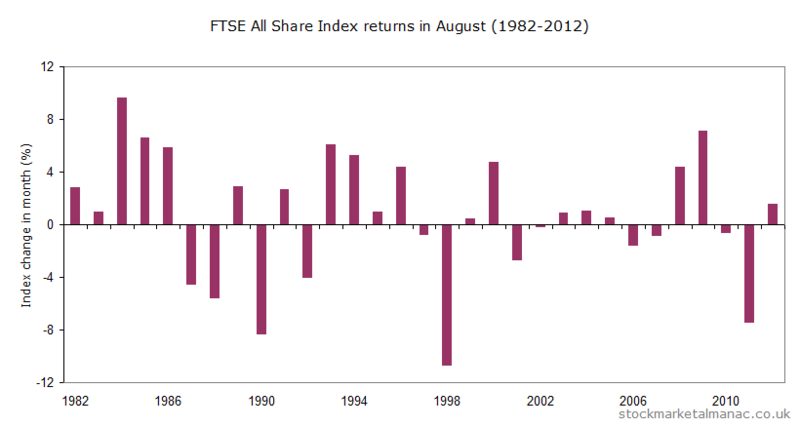 The accompanying chart plots the percentage performance of the FTSE All Share Index for each August since 1982. For example, last year in 2012 the market rose 1.5% in August. As can be seen, returns in August are more often positive than negative, although when the market does fall in this month it can suffer quite a large fall. In an average month for August the market tends to trade flat for the first couple of weeks and then gently increase for the final two weeks of the month. 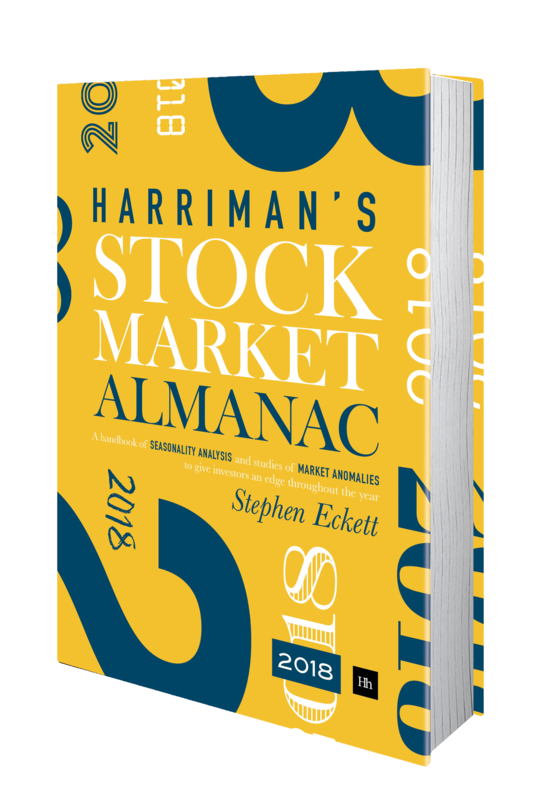 The final trading day of the month has historically been strong – the third strongest final trading day of all months in the year. An interesting characteristic of August is that it is the strongest month for the FTSE 100 Index relative the S&P500 Index – UK shares like August (or US shares don’t like the month)! In the 29 years since the inception of the FTSE 100 Index, it has out-performed the US index in 18 years. In the last twenty years the sectors that have been strong in August have been: Food & Drug Retailers, Household Goods, and Health Care Equipment & Services. While on the other side, the only sector that has been consistently weak this month has been Chemicals. For stocks, the following companies have performed well in August over the last ten years: Fisher (James) & Sons, Keller Group, and Bunzl (these shares have risen in at least nine of the last ten years in August (Fisher is the only FTSE 350 stock whose shares have risen every August since 2003). The shares that don’t seem to like August are: Investec, Rio Tinto and Pennon Group (these shares have fallen in August in eight of the past ten years). Dates to watch out for this month are: 8 August when the MPC interest rate announcement will be made, 14 August when the results of the MSCI index review are announced (and which can move the prices of stocks affected). And if you get up early to trade the market on 26 August, go back to bed – it’s the Summer bank holiday and the London Stock Exchange is closed! Tomorrow, Thursday, will be the first trading day (FTD) of August. Since 1984, the FTSE 100 Index has risen on average 0.03% on the August FTD – ranking it 7th of all the monthly FTDs. The index has had a positive return on this day in 62% of years since 1984. 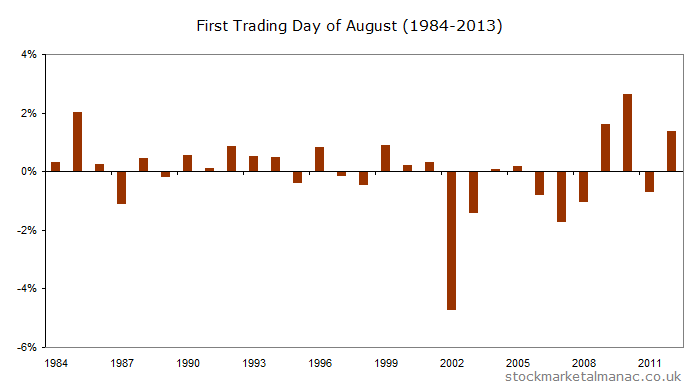 The following chart shows the returns for every August FTD since 1984.